Keiji Akaashi is a second year at Fukurōdani Academy, and he is the volleyball team's vice captain and setter. 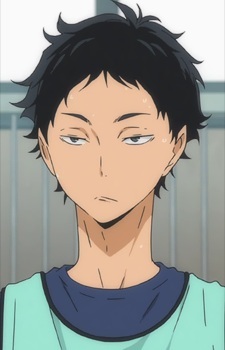 Akaashi seems calm and composed most of the time, and doesn't show a wide range of emotions. He tends to call people out on the foolish things they do, especially Bokuto, who he seems to be relatively close with despite their opposite personalities. Opposed to being shy, Akaashi is very blunt in the things he says and is not afraid to show his opinions. He is polite to a certain extent, however, owing to his polite manner of speaking. He is also humble, knowing his own limits in his setting abilities as he pointed out he couldn't have done what Kageyama could.